Deciding where to stay in Bangkok, more than in many other cities, can really make or break your trip. Thailand’s capital city of Bangkok is home to more than 9.5 million people. If you look at a map of Bangkok you’ll be more than overwhelmed trying to figure out where to stay. If this is your first time in Bangkok you want to pick a location that is central and suits your travel style. 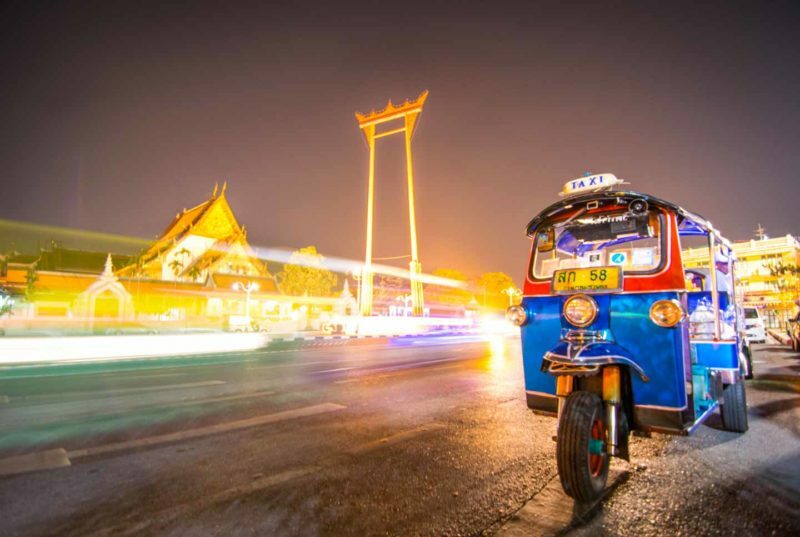 Bangkok is a city that never sleeps and is full of lights, sounds, smells, and great food. Bangkok is one of our favorite cities in the world and we’ve stayed in hotels all over the city. We know a thing or two about where to stay in Bangkok. We’re going to go through each area of Bangkok, describe the area and tell you the Pros & Cons. In each area of the city, we will show you what there is to do in and list a few suggested hotels. In Asia, we found the best selection of hotels on Agoda.com. Many hotels in Southeast Asia are only on Agoda and not on your usual USA online booking platform. If you’re from the United States you may not have heard about Agoda.com or booked with them, but they have the best inventory when traveling in Asia. Agoda has been around since 2005 and is part of Priceline since 2007 and they have always had great service. Our favorite area of Bangkok to stay is Sukhumvit. Our first time in Bangkok was on our Thailand honeymoon where we stayed right on Sukhumvit Road. Sukhumvit is one of the main roads in Bangkok and it’s very long. We like to stay in the Sukhumvit Road area as the BTS (Bangkok Transit System) runs right down the road making it easy to get around. There are tons of hotels for every budget, tasty street food all around, great shopping malls. Also, at night local vendors set up shop along the street at night, and much more. You’ll find the best selection of hotels in the Sukhumvit area, it’s the best stay between Sukhumvit between Soi 1-39. We like the area around Sukhumvit & Soi 21 area the best. Soi is the name for the small side roads that run 90 degrees from the main roads in Thailand. The Soi’s are related to the road, in this case, Sukhumvit road. The BTS connects to the Bangkok Airport Rail Link to the BKK airport making it a great option during rush hour in Bangkok. Pros: Close to public transport, central location, great hotel selection, and good local & western food options. Cons: The only con is you’re not really by any of the main tourist attractions in Bangkok. However, the ease of getting to them with the BTS or cheap taxies make up for it. The Siam area of Bangkok is also on Sukhumvit Road but just further down the road heading towards the river. The Siam Skytrain station is one of the busiest BTS stops as there are several huge shopping malls here like: Siam Paragon, Siam Center, Siam Discovery, Central World Mall, and MBK Center. You will more than likely find yourself here on more than one occasion. Bangkok is known for its Skybars thanks to the movie “Hangover 2”. One of the best skybars in Bangkok is located in the Siam Area on the 55th floor of the Centra Grand Hotel. It has an amazing view and happy hour with buy one get one drinks daily. Cons: You don’t always feel like you’re in Bangkok, it’s very glitzy & glamour. If you’re on a budget or traveling solo and looking for other fun travelers Lub’d is great. We’ve always stayed in the private rooms but they do have affordable dorms. They have a great social area and are organizing activities every day. It’s also the cleanest hostel/guest house we’ve ever stayed in. Silom is one of the best places to stay in Bangkok. We tend to mix up our hotel stays between Silom hotels and Sukhumvit hotels. Silom is considered the financial district of Bangkok. Here you’ll find skyscrapers, large expat community, and Bangkok’s largest park Lumphini Park. If you’re looking for something always going on 24/7 this might not be the right part of Bangkok for you. Some of our favorite restaurants in Bangkok are in the Silom area. Pros: Nearby BTS & MRT subway lines, great food options, a bit quieter place to stay in Bangkok. Cons: There isn’t a ton to do in the area and the nightlife isn’t lively. Have a drink at Lebua State Tower skybar made famous from the Hangover 2. Note there is a dress code and drinks are pricey. Visit one of the world’s most famous red-light districts, Patpong where Thailand’s Go-Go culture began. Note: This is not family friendly. Have a meal at Baan Somtom which translates to ‘house of the papaya salad’, Somtom is one of Thailands best dishes. At Baan Somtom there have several variations, it’s a great place to try local Thai dishes to see what you like. Have a spa day at Dahra Spa, they have crazy specials if booked online in advance. We’ve never stayed in the Riverside Area of Bangkok but many of our friends have and love the area. Here you will find some of the most luxurious hotels in Bangkok like the Four Seasons Bangkok, The Peninsula Bangkok, and the Mandarin Oriental. The BTS line ends at the south end of the river which can make this area of Bangkok not the easiest to get transportation. Cons: Lack of public transportation, the BTS or MRT end at one point along the riverfront. You’ll have to taxi or tuk-tuk everywhere. Visit The Grand Palace – Wat Phra Kaeo, make sure to bring pants & something to cover your shoulders. Head to Wat Pho the reclining Buddha at sunset, very few tourists are here this time of day. Ride the river ferry up or down the river as you make your way checking out all the things to do in Bangkok. Take a dinner cruise on the Chao Praya River. Pick up a bouquet of flowers at the Pak Klong Talat flower market. On every trip to Bangkok, we spend at least one night out on Khaosan Road. It’s hard to describe the madness of the area of Bangkok. Everything and anything goes. It’s a great place to meet other backpackers and travelers. If you’re on a budget it’s full of budget hostels but we personally don’t like to stay in the Khaosan area. It’s great to spend a few hours drinking with friends, but we wouldn’t want to base ourselves there while in Bangkok. Make sure to read our street food safety guide before eating everything and anything in Asia. Pros: Great people watching, cheap massages and street food, close to major tourist attractions in Bangkok. Cons: IT can be very loud since it is a big party scene, also it can feel a bit inauthentic with so many tourists in a small area of Bangkok. People watching on Khaosan Road is top notch. Eat a scorpion or anything in the bug cart. Get a 200baht an hour foot massage. Drink one too many beers or fishbowls. Pick up cheap Thailand souvenirs. Full of neon signs and tons of smells coming from some of the best street food in Bangkok. Bangkok’s Chinatown is one of the largest Chinatowns in the world. We’ve personally never stayed in Bangkok’s Chinatown as we only find ourselves in the area for a few hours on when spending 3 days in Bangkok. Go on a Chinatown street food tour, it’s the best way to taste it all. Cons: Lack of public transportation. Not along the MRT or BTS subway lines. There are two airports in Bangkok, the main one is Suvarnabhumi Airport (BKK) and Don Mueang Airport (DMK) which is only used by two airlines: Air Asia and Nok Air. The only reason to stay at a hotel near Bangkok Airport is if you have an early morning flight and even then we’d opt to stay in the city. Getting to the airport is relatively easy and cheap, Uber has fixed rates to the airport 425 baht ($12 USD) and taxis typically run the meter but we’ve never paid more than 450 baht. There is also the Bangkok Airport Rail Link which we highly suggest during rush hour, check Google maps to see current drive times. The Airport Link only operates 6 am to midnight daily, so if you have a super early morning flight this isn’t an option. If you have a long layover in BKK a hotel might be a good option to relax at for a few hours. Most airport hotels have free shuttles to and from the airport. A 3-star hotel near the airport can be found for under $20 a night. We love renting an apartment in cities, but Bangkok isn’t the best place for it. Especially if it is your first time in Bangkok. The city is huge, you really want to make sure you know the area before staying in a Bangkok Airbnb. You don’t want to end up staying an hour away from all the main attractions. Don’t forget the travel insurance! We personally have used travel insurance with World Nomads. Coverage includes medical, trip cancellation, your belongings from theft or damage, baggage, car rental coverage, and more. They covered us when Hannah got robbed in Kuala Lumpur and when we got in a sand storm in Namibia and it damaged camera gear. Hopefully, we gave you some insight on where to stay in Bangkok with this post. You should have a little better understanding of the city and the area best for you. After your first visit to the city, you’ll figure out your favorite parts so on the next visit you’ll know right where to stay. We’d love to hear your favorite part of Bangkok and what’s your go-to Bangkok hotel? We know we’ll be back and we’re always up for trying a new hotel and staying in another area of town. Thank you so much for the info! I see you make mention of AirBNBs. I read an article saying their illegal for stays less than 30 days. Do know if this is the case? Do you recommend still booking through AirBNB since I still see them available online? Hi Lee – I have never heard that law/rule. There is a chance it might be true, but I doubt it. Either way, if it is, it’s not enforced. We just stayed 3 night in Bangkok in a really nice AirBNB this January and the same thing in Chiang Mai. I won’t hesitate to book an AirBNB in Bangkok. Have a great trip! super helpful! going to bangkok for the first time in a few weeks and was not sure where to stay! was considering the Lub d hostel so glad to see it on your recos. Hope you have an amazing time in Bangkok. Lub’d D is a great place to stay in Bangkok and really nice on the wallet too! thank you so much, it is a big help for me as a new traveller in Thailand. Glad we could help you decide where you should stay in Bangkok. What part of Bangkok did you decide on? We are heading back next month! This is a great guide! I have not been to Bangkok for years, and back then I was Couchsurfing, so I was more concerned with getting a local experience. Now that I am planning another upcoming trip to the country with my travel partner, I am looking for a place that is both central and affordable – this guide really helped!